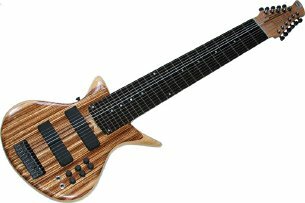 Austin Douglas GuitarTM (all mahogany) designed by Mark Warr: 10 strings - My tuning incorporates 5 bass strings tuned in fifths, 5 guitar strings tuned in fourths. It was my "main axe" from 1998-2002. You can hear it prominently on Cinema Inferno and the MP3's that are on this web page. Though I play more Warr these days, I still love my ADG - it was such a joy when I got it in 1998, my first true "tap guitar" with a body. Roland® GP-100 preamp/processor (for amplifying guitar strings). Sans Amp® PSA-1 preamp (for amplifying bass strings). Roland KC-100 Amplifier, for sound reenforcement in smaller venues, and also a great practice/rehearsal amp. Line 6 POD - my pre-amp for the 8 string guitars. It does a nice job from low to high in one unit. Sans Amp GT-2, I used this for all the distortion on Cinema Inferno, I am also finding that it is a great pre-amp for the 8 string ADG. I also have a SansAmp TRI-OD that I don't use very much any more, but it has great distortion. Q: How does the ADG compare to (insert brand here) tapping instruement? A: It's like this. It's really not safe for me to make comparisons of the ADG with instruments from other manufacturers, for a lot of reasons. I don't know what kind of music you want to make, what sound you expect, etc. Furthermore, some of these manufacturers have two or three models with different tonal options, which I may not familiar with, though I played one very well known tapping instrument from 1993 until 1998 on many many gigs. I don't play that one anymore. But what I will say is that the ADG is my first choice when I take the concert stage, it has a great, solid fundamental tone, and I find it to be the most comfortable tapping instrument to play of all of them (bar none), especially, in the case of the 10 string, with the Slider strap. I think that the biggest advantage Warr guitars have over ADG's is that Warrs have a number of great tones (through pickup selection switch, tone controls, etc.) while the ADG has one great tone, which you can effect, distort, etc., with your amp rig. I also find the simplicity of design a bonus in the ADG. Sometimes less is more. SInce ADG and Warr come from the same shop, you know the ADG's are made to a high standard, but with a more basic design, compared to their Warr cousins. Q: What Tone Woods do you prefer? A: It depends. Maple and Swamp Ash are a great combination in a guitar. Both my 8 strings have this set up. It is bright with a really clear bass sound. This is a modern bass tone and a guitar tone that cuts when clean. This is 'old-school' guitar technology, proven through decades of electric axe construction, but it is tried and true. I also have the all-mahogany ADG. The distortion on this baby is awesome, for that over the top, midrangey, mellow, Santana/Fripp/Anastasio sound. Infinite feedback, with the speakers cranked, is a real joy on this instrument. The bass is also mellow, and great with tube amps for a 60's sound (Phil Lesh, Jack Cassady, etc.). This might not be ideal for a modern bass tone, but I like it for old school rock. I think that the Bartolini pickups contribute a lot to the distnictive sound of all Warr/ADG's. The next time I go into the studio I am looking forward to blending different sounding tap guitars on record, for a true tapping TONE experience. Q: How about active circuitry? Neck Through?